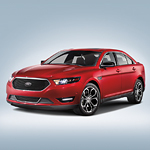 The Ford Taurus has a lot of interior features to enjoy in Columbus. At Bill Russell Ford Lincoln, you can see why this is such a popular full-size sedan. One of the first things you’ll notice is the spacious seating. You can seat five easily on your choice of cloth or leather seats. There are plenty of adjustments that can be made to the seats, too. If you have more cargo than what will fit in the trunk, you can fold the seats down in a 60/40 split. A lot of technology will allow you to enjoy your drive. Heated and cooled seats are available. There are also 12 speakers in the Taurus, allowing you to take advantage of a Sony audio system. Of course, you’ll have Sync and Bluetooth, too. Plus, there’s ambient lighting available, allowing you to scroll through to select the color you desire.